Survivors of Asiana Airlines' S.F. jet crash have been offered $10,000 each. 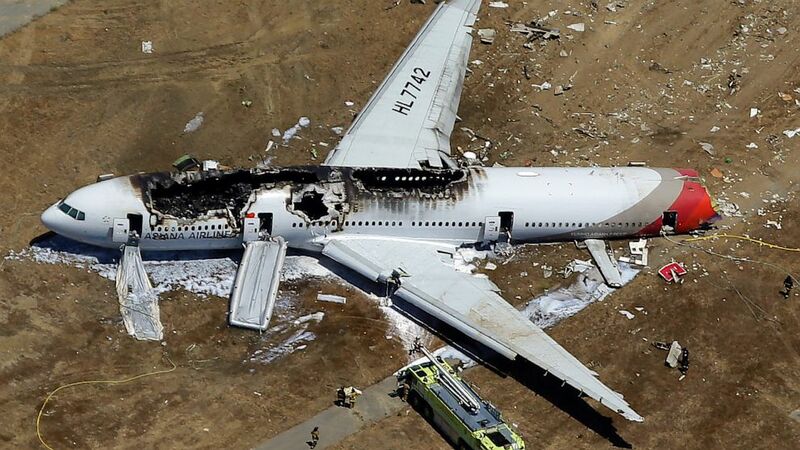 camera (Marcio Jose Sanchez/AP Photo) Asiana Flight 214 lies on the ground after it crashed at the San Francisco International Airport, in San Francisco, July 6, 2013. Survivors of the Asiana Airlines jet that crash-landed in San Francisco last month have each been offered initial compensation of $10,000 by the airline. Legal experts, however, say that final settlements could go far higher depending on a host of variables, including each passenger's nationality, point of origin, and whether they were flying one-way or round-trip. Lee Hyo Min, a spokesman for Asiana, told Bloomberg News that 288 survivors of the crash are eligible for the $10,000 payment, which, said Min, they would be offered whether they had been injured or not. "Even if they are not hurt or they don't go to hospital, we will still give them this money," she said. Airlines are required to make such "down payments" by U.S. law and regulation, and by the Montreal Convention to which both the U.S. and South Korea are signatories, according to California attorney Mike Danko, who is representing a half dozen of the crash survivors. Three people died in the crash of Asiana's Boeing 777, after it struck a seawall while making its final approach to San Francisco International Airport July 6. The U.S. National Transportation Safety Board has yet to complete its investigation of the incident. Asiana's spokesman told Bloomberg News the airline might offer a more substantial settlement following NTSB's investigation. Attempts by ABC News to get further comment from Asiana were not successful. Danko, whose firm, Danko Meredith, is located in Redwood Shores, less than two miles south of the airport, says the crash happened practically "right outside my door." The Montreal Convention, he explains, provides compensation for emotional injuries (e.g., post traumatic stress disorder) only to the extent they derive from physical injuries: Somebody whose knee was twisted in the crash can be compensated for that injury plus any emotional stress specific to it. Under U.S., law, by contrast, a survivor can sue for emotional trauma that goes beyond his physical injury and may last for months or years. Result: Passengers eligible to sue under U.S. law face a potentially huge payday. Ones eligible to sue under the Montreal Convention stand to get far less. He estimates about half the passengers will fall into the second category. Under the Convention, persons without physical injuries could wind up with no compensation beyond the $10,000 already paid them by the airline. Their acceptance of the $10,000, by the terms of the Convention, does not waive their right to sue. Three 16-year old girls were killed in the crash—all three of them classmates, Danko says. In the U.S., the compensation for each life would be into the millions of dollars. The FAA, he says, by its own analysis, put a value on human life of $6 million per person. If the parents of the three teens were to bring suit in China, he says, they could expect compensation of a few thousand dollars per child.